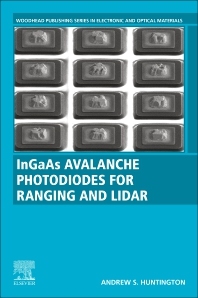 InGaAs Avalanche Photodiodes for Ranging and Lidar discusses the materials, physics and design considerations necessary for the 3D image sensing applications that will enable self-driving cars and autonomously-navigating drones. The book's author provides an overview of the fundamentals of APDs, the remaining challenges that researchers and engineers are working to solve, and how to apply them in the real-world. Key features of the book include its emphasis on design considerations, how they may impact device performance, and on detector characteristics that cover both the theoretical definition of common figures of merit and their practical impact on sensor system performance. In addition, the author reviews desired performance characteristics and practical manufacturing constraints, including how APD figures of merit would impact photoreceiver performance. In particular, crystal growth, material selection and application issues that impact design considerations are addressed. Dr. Andrew Huntington manages Voxtel’s Semiconductor Detector and Device Development Group since 2004 and is responsible for Voxtel’s advanced development efforts relating to semiconductor devices, material growth, device modeling, and detector design and development efforts. He invented and patented Voxtel’s advanced high-gain, low-excess-noise SCM-APD technologies, and has supported this important device’s development through Monte Carlo modeling and experimental extraction of the material’s properties. He has also managed the development of Voxtel’s array process and APD-based commercial products. The detector projects Dr. Huntington has conducted include Geiger- and linear-mode SOI CMOS and InGaAs-based APDs for the NIR; HgCdTe APDs for the SWIR, MWIR, and LWIR; and silicon-based linear APDs for visible and X ray applications. He has a number of publications detailing this work. Prior to joining Voxtel, Dr. Huntington performed his doctoral studies in materials at the University of California, Santa Barbara (L. Coldren Group), where his dissertation work included development of low-noise and broad-area InGaAs/InAlAs APDs. Dr. Huntington developed his expertise in the production of APD wafers by molecular beam epitaxy, with particular emphasis on understanding the relationship between growth conditions, material quality, and device performance.